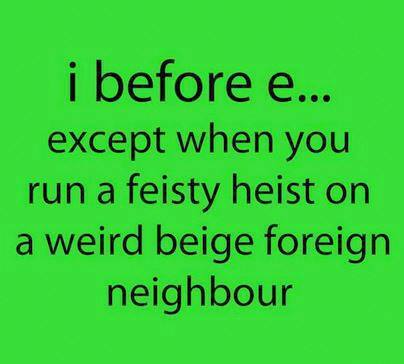 English Teacher On The Loose: 5 Lifehacks for Super English Spelling! 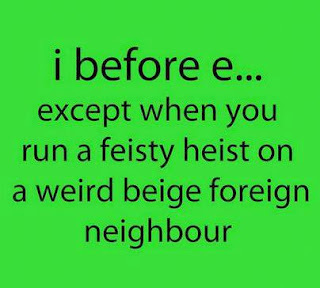 5 Lifehacks for Super English Spelling! Lifehacks* are terrific ways of remembering tricky stuff! So without the benefit of one of the those snazzy You Tube vids (I am not up to that level of tech just yet) here are five spelling lifehacks for English! * You will also see 'life hack' written as two words. POETRY: I learnt to spell difficulty with the very same poem represented here in the wonderful film adaptation of Roald Dahl's book 'Matilda'. You can use Mr. just as well as Mrs. - the rhythm is the same. Or 'When two vowels go walking, the first does the talking.' Meaning that the first vowel in the pair is the sound that's pronounced. In words with a double vowel that makes one sound, this is usually the case. ACROSTICS: Make up silly sentences from the letters of words that you always spell incorrectly. PATTERNS WITHIN WORDS: Look for motifs within the word you want to remember. MNEMONICS (Memory triggers): These are often mental images. Never remember how many Cs or Ss in necessary? Think of a businessman getting ready for work; it is necessary for him to have one collar and two socks, so one C and two Ss. This also works for homonyms: words that sound the same but have different meanings. How do you remember which ones the right one. Wear and Where? The one that describes place has the word here in it. Hear and here? Hear is what you do with you ears and here is there. BACK TO BASICS: Break words down into parts. PREFIXES AND SUFFIXES: This is especially true of adverbs and words whose prefix ends with the same letter the word begins with. I hope you enjoyed these hacks and find them helpful. Be sure to follow my blog for more fun and games learning English!